The closely-related Nokia 106 and Nokia 107 Dual SIM are a pair of simple and inexpensive handsets brightened a few nice features under the surface. 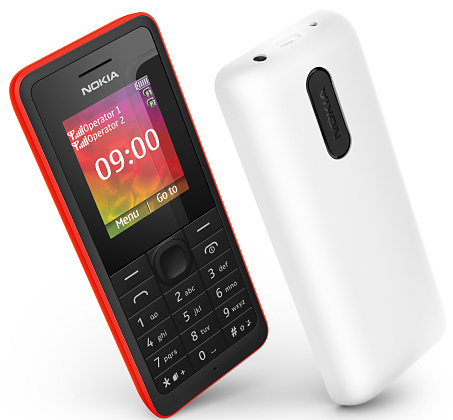 Smartly decked out in Nokia's current style of brightly coloured plastics, the Nokia 106 and 107 have a 1.8" 128 x 160 pixel colour TFT display in a traditionally-designed monoblock handset, running Nokia's basic Series 30 platform. Both models have built-in games, a dustproof and splashproof keymat, a flashlight and an FM radio with a loud 103 phons speaker and a 3.5mm audio socket, although only the 107 has the wired headset in the box needed to make it work. Neither the 106 nor 107 have a camera, Bluetooth or a web browser. Although cosmetically these two devices are almost identical, the 107 is more interesting inside with dual-SIM support, an MP3 player and a microSD slot. This makes the 107 an attractive music player, especially as it includes a headset. Inside is the familiar BL-5C battery which has been used by dozens of Nokia handsets for years and years. Nokia say that the 106 has almost 10 hours talktime and 35 days standby time, and the 107 comes in at 12 hours talktime and 24 days standby. Both handsets weigh approximately 75 grams. No guidance was given on price, but we would anticipate that the 107 would cost around €30 before tax and subsidy and the 106 around €20. Both handsets will be available in red, black and white colours and should start shipping during Q3 2013.